Well, they get evaluated and a lot goes into those evaluations. Recruiting evaluations on the surface differ a little bit from NFL Draft and Free Agency evaluations. Evaluation in recruiting is more about projections since the players are young and also involve several other factors. So for this read, let’s take you through how a college football recruit gets evaluated step by step. This is very crucial for college coaches on the recruiting trail. Many programs subscribe to some kind of recruiting service that gives them a list of thousands of players’ names in January and February of each year. Connections are also important because maybe a coach has a friend at a high school who has a good recruit or knows somebody who knows of a player in a small town who many schools are not in on. 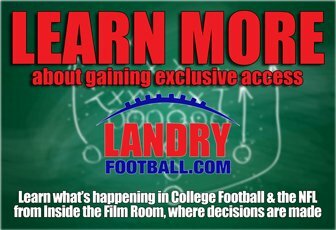 Coaches and scouts have different ways to get their hands on film/tape of potential recruits. 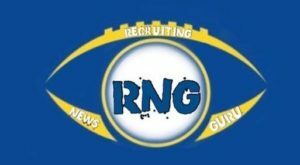 Many programs subscribe to a recruiting service which loads footage of recruits onto a server or site where a staff can all watch and evaluate a recruit. High school coaches and recruits are also very proactive these days. Colleges get thousands of highlight DVDs mailed to them everyday from all over the country from coaches, players and parents. As a scout at heart, this is where I relish evaluating and many coaches at colleges do too. The tape doesn’t lie. Every coach in the country wants a big team, and to have a big team, you need big players. I don’t care if a recruit can’t play a lick, if he’s big then he’s at least going to get a recruiting letter or two. Coaches and scouts are naturally attracted to size because the biggest players catch their attention because they stand out. So the first thing an evaluator looks for is size and this is for each position. The 6’4″ QB, the 6’6″ OL, the 6’0″ CB and so on. Size is the first thing everyone looks at. So after a scout or a college coach sees that “big” player that they’re initially drawn to, the next thing they want to see is if the guy can run. Speed is so important these days because the game is played at an amazing pace on each play. Even the linemen recruits must have some speed to be successful for their position because if they can’t run then that limits what they can do on the field. Even the recruits who aren’t the biggest for their position yet still have a ton of speed will garner a ton of attention. Last year, LeAndrew Gordonwas a 5’7″ WR but still signed with Kansas State because he’s one of the fastest players in the country. Even 5’8″ WR Tavon Austin is on the verge of being a first-round pick next month. So a college coach has a tip from a friend about a player he needs to go see. The coach sees the guy on film and likes him. Then he goes to see him play in person and likes his size along with noticing that he can run a little bit. So far he’s interested and is moving forward with his general evaluation. Next, the coach will want to see how good of an athlete the player is. You’ve heard me millions of times use phrases like “athleticism”, “athletic ability” and “movement skills”. All of that refers to a player’s agility, balance, change of direction skills, hip flexibility, knee bending, body quickness, lateral movement ability and leaping ability among other things. If the coach/scout sees the player has adequate athleticism, then he’s really interested now. If the player is deemed a bit stiff or straight-linish, then the player has to have a dominant trait or skill in another area of his evaluation to overcome his lack of athleticism. The player that the coach/scout’s connection tipped him on has passed the eyeball test, has some speed and is a solid athlete. So what’s next? Well, if we’re talking about an OL or DL prospect along with perhaps a LB prospect, then his strength needs to be checked out. Aside from looking at tape and judging the player’s strength from those studies, the coach/scout will look into the player’s weight room numbers. If the player is strong at this point then great, but college strength and conditioning programs are extremely beneficial these days. A player who’s not overly strong at the high school level can still get stronger once he goes through the rigors of a college weight training program. Alright, so now you have a player who the college coach or scout likes on tape, has good size, runs well, shows some movement skills and has strength potential. So now we move into where the evaluator will begin to evaluate the recruit specifically at his current position. This can get tricky at the high school level because some schools don’t have good coaching, lack a good scheme and play a lot of players out of position. So if the recruit is playing QB, then this is where we’ll evaluate his mechanics, arm strength, accuracy, decision-making and so forth. Or if the guy is a DB then here’s where we’ll evaluate his mirror skills, transition quickness, short area closing ability, awareness and instincts, etc. So maybe that prospect grades out a little low as a QB, but his athleticism and speed are good. Here’s where evaluation in recruiting becomes vital and differs from the draft and free agency. This is where the coach/scout must project where exactly could the recruit fit and be successful at. So that athletic and speedy QB may be a great WR with some coaching. Or that MLB may be a little too small for a college’s defensive scheme, but he’s instinctive and could be a good SS. Coaches and scouts have to do a lot of projecting and looking into the future when it comes to evaluating high school players, and the ones with a lot of potential get a lot of attention. Not a lot of stock is put into these settings, as college coaches can’t really come out to these types of events anymore. However, this is where their connections come into play again. A coach may know one of the staff members of the event and has him keep an eye on the recruit. The producers of these events also sell result lists to colleges who pay a fee to get their hands on them. Also, many of these events get a ton of coverage from recruiting sites so coaches will read the recap pieces since they can’t really come around. These events can also serve a recruit well should he light them up. Last year, nobody knew who Robbie Rhodes was coming into the spring until he put on a couple shows at a few events and ascended up recruiting boards. Rhodes signed with Baylor and was one of the top 60 recruits in the nation by year’s end. You may be asking “what does location have to do with anything?”, so let me explain. California, Florida and Texas are three of the best states for football. Georgia, Alabama, Virginia and Ohio are up there too. If a recruit is from an area or school that is known for traditionally producing talent, then that bodes well and coaches/scouts do take that into consideration. Honestly, coaches are going to flock to see Sony Michel because he’s in Florida before they go see a RB from South Dakota. With those hotbed areas come the assurance that the recruit has been facing good competition. If he’s been producing against good competition then his chances of producing in college become that much greater. I’m sorry to tell you this, but college programs have to win football games. So they need good players and that’s what they look for first. Colleges want potential All-Americans more than they want potential academic All-Americans. Should grades and academic standing be higher on this list? Absolutely. But it’s not the highest priority for coaches and scouts; that’s just how it is. However, after the coach has taken all the before mentioned steps in his assessment and evaluation of a recruit, he’ll look into the recruit’s grades. If the recruit is really talented and the coach is really impressed, sometimes they’ll even offer the recruit a scholarship before ever even thinking about the recruit’s grades. It happens more frequently than you think. This is last on this list but many coaches and scouts will ask around about a player’s character throughout the process. From asking the player’s high school coaches, teachers, counselors and principal about his behavior, demeanor and personality to looking into a player’s family situation and background, coaches and scouts will check out the recruit’s character. After they evaluate him as a player first. Edwin Weathersby is the College Football Recruiting Analyst for Bleacher Report. He has worked in scouting/player personnel departments for three professional football teams, including the New York Giants, Cleveland Browns and the Las Vegas Gladiators of the Arena League. He spent a year evaluating prep prospects and writing specific recruiting and scouting content articles for Student Sports Football (formerly ESPN Rise-HS). A syndicated scout and writer, he’s also contributed to WeAreSC.com, GatorBait.net and Diamonds in the Rough Inc., a College Football and NFL Draft magazine. The world of pro personnel evaluation differs from college evaluations in that you are not projection players like you do in college but rather evaluating how they are performing currently at the NFL level. While the same critical factors and position specifics apply to NFL players, after placing a number grade on a player, they are lumped into a color graded category. Every team has a pro board in their draft meeting room where each teams’ depth chart is up with individual cards placed in each position group. All the pertinent data on the player is on the card including his college grade and pro grade. By having a color coded graded attached, it gives a visually appealing look at all teams at a glance and see where you think they are weak and strong based on the colors grades at each position. This helps to forecast if a team might be willing to release or interested in trading a player or interested in trading for a player. This grading scale is designed to separate classes of players as well as skill sets and athletic traits. The grade only reflects what a player is currently, not what he was or can be. 7.4 – 7.0 (BLUE) = BLUE players are the top line players in the league. BLUE Players make the plays that are the difference in close games. They have Superior talent and consistently make big plays. 7.4 = One of the top handful of players in the league if not the best. 7.0 = One of top players at his position in the league. 6.9 – 6.5 (RED) = RED players win for you. They have starter type production in the league. The Top line REDS are usually BLUE in either the running or passing game but fall short in the other. RED players are impact players and start on contending teams. 6.9 = One of the best players at his position in the league. You must game plan for their presence. 6.5 = High level player at his position in the league. They cause some match up problems. 6.4 – 6.0 (PURPLE) = PURPLE players are players that you can win with even if they are not players that can win for you. They are usually RED in some areas and can match up with some REDS but overall fall short of REDS. PURPLES are very good players. They are solid starters who will usually get the job done in at least some areas. The Pro Personnel scouting axiom is to not play anyone below a PURPLE. 6.4= Upper tier in the solid starter category and are close to being a RED and may even be in some areas. 6.0 = Solid starter but not on the verge of being in the REDS and may even be close to trending to ORANGE. Could be a declining veteran or someone lacking in special physical or intangible traits. 5.9 – 5.5 (GREEN) = GREENS are young players with upside potential. While you may not be able to currently play them much, it is due to inexperience and not physical or intangible traits. You cannot to play too many GREENS unless you are in a rebuilding year or out of playoff contention. 5.9 = Players with lots of physical ability with inexperience the only thing holding them back to being in the RED area or above. 5.5 = Good young players with the physical ability with inexperience the only thing holding them back to being in the PURPLE area or above. The above 3 rating areas are the minimum of what a club must have to win. Any Player below purple must be upgraded or the club does not match up at that position creating a mismatch advantage for their opponents. 5.4 – 5.0 (ORANGE) = An ORANGE player is one with backup ability and/or production only. They do not match up versus the REDS and are dominated by the BLUES. An ORANGE should make your squad only if they are a RED or BLUE special teamer. Otherwise, you must replace your ORANGES. 5.4 = A player with ORANGE production but may have PURPLE or above physical or intangible traits. 5.0= A player who will never be more than a back up roster player and one that you must replace unless he is a RED or BLUE special teamer. 4.9 – 4.5 (YELLOW) = A YELLOW player is one who lacks the ability and skills to contribute even as a backup OR someone who has serious medical or character issues. In any of these cases, these players are not worth developing. 4.9 = A player who is not good enough at this point but may have some qualities to develop into a backup at some point. Usually someone with decent physical traits but trying to overcome medical or character flaws. 4.5 = A player that you think is not good enough and likely has serious playing, medical or character flaws and therefore not worth developing. INJURED PLAYER (GRAY) = A injured player is designated by a GRAY coloring or circling as even though he currently is not producing, he must be kept alive based onprevious ability and skill level and anticipated return of health. It’s one thing to have an opinion of a draft prospect, but it’s quite another to articulate that opinion to a group of your colleagues in a way that can be useful in the decision-making process, and can be understood even if you’re not standing there waving your arms and gushing about him or crinkling your nose in disgust. But after the personnel department hashes everything out, they need to reach a conclusion, even if dissenting opinions exist (and they do, all the time.) You either believe a guy is going to be X or he’s going to be Y, but the organization has got to make a call. The organization drafts as one, and the organization either tries to sign an undrafted prospect or they don’t. Each personnel department has its own approach that comes from the top down, but most follow common practices, which makes orienting scouts hired from other organizations more efficient. It’s analogous to the common elements in NFL playbooks; of course there’s variation, but there are only so many ways to describe receivers’ route trees, and there’s a benefit to employing language that newcomers from other teams will find familiar and comfortable. Before the prospects go up on the team’s master draft board, they get a grade, and most teams use a similar system. Some of the more serious NFL Draft analysts in the media do the same, which is no surprise given that some of them have experience as scouts, and many of the rest wish they did! Most commonly, a team assigns a numerical grade that represents their best projection of what that prospect should become as a professional in the National Football League. The following table melds a system taken directly from the scouting manual of an NFL team from the mid-2000s with descriptive text from a similar system used by long-time veteran scout and personnel executive Greg Gabriel of the National Football Post. There are subtle variations, but the approach is very similar. In our iGMTM virtual NFL General Manager simulation, we use the Ourlads system, but the numbers don’t show anywhere on the site. They’re used behind the scenes in a few ways, like to support the calculations made when the computer picks in our Mock Drafts. If you have a prospect ranked 37th, for example, he may carry a numerical grade of, say, 8.76. We’ll multiply that value by a factor a bit above 1.00 if a team has a need at the prospect’s position, or a bit less than that if they don’t. When you’re setting up your rankings, you assign a “Grade” of R1+/R1, R1-/R2+, R2/R2-, R3, R4, R5, R6, R7, PFA (“priority free agent,”) FA (other “free agent,”) or NR (“not ranked,” a simple catch-all for anyone you’re not interested in.) You can then re-rank prospects within each group. Behind the scenes, our system assigns Ourlads-system numerical grades automatically, but you don’t need to bother with them. Fundamentally, most drafts have really only about twenty or so prospects who are clearly first-rounders. Then there’s a group that could go late in R1 or towards the top of R2. Our system encourages you to set your board up that way, but, of course, you’re free to use it any way you like. I have developed both a Digital Draft Board and a Digital Pro Board. The digital pro board tracked movement throughout the NFL of players from 53-man rosters, to practice squads or those put on injured reserve) as well as priority free agents, street free agents and emergency list players and or trades. Emergency player listing is extremely important and is used in case there are injuries, which happen every day. For a player that is injured in a game, they must be replaced. Personnel directors and general managers look at this list during games once notified of major long- term injuries. This allows the personnel staff quick reference so they can start calling agents immediately. These calls are made mid-game if needed. Emergency players are those on the street with NFL experience and good production. The grading chart ranges from 8.00 down to 1.0. The same grading scale is used to keep continuity between college and pro player reports, even though the description relates to the level of play. Players are grouped by color before a grade is given. A numerical grade is added for stacking purposes later, creating separation. BLUE: Blue players are playmakers and difference- makers in every game. Playoff teams need at least 10 or more on the roster. RED: Starters/heavy contributors teams can win with right away. They have Blue traits with ascending skill set. ORANGE: Backup/special teams players with limited production. They struggle to match up with high red players and have limited skill set to ascend to a low red player. GREEN: A high percentage of free- agent greenies get hurt and lack the skill set to ascend to an Orange player. Computer systems are designed to down grade those players who do not grade out high in their Critical Factors (Athletic Ability, Strength/Explosion, Playing Speed, Competitiveness, and Size). Our goal is to build a Championship team with Fast, Athletic football players, who are Productive, Tough Mentally/Physically, solid Work Ethic, Competitive with good Character. The principles behind the grading system are not to grade the players for you, but rather guide you towards the prospects that fit into our philosophy. The grading system will look to eliminate these who don’t. In order to be considered as a potential starter (6.0 or higher) for this franchise, the player must meet specific requirements for the position. If he meets these requirements, the grading system will lead you to the grade he should receive. You as a Scout may agree or disagree with the systems grade, but you are at least aware that he has certain specifics and that he may be “what we are looking for as a player”. It is very important for our Organization that we all (Scouts) are on the same page in terms of player evaluation. Before you go on the road this year, you should have a clear understanding of what we are looking for with regard to position and character. Allow the grading system and lettering system describe the player, and do not let your personal feeling about a player make you down grade him. For example; a prospect meets all the specific requirements for his position and is a Competitive, Productive prospect and plays at a high level of competition, but has some major Character issues. DON’T DOWN GRADE PLAYERS FOR CHARACTER ISSUES!! Let the grading and lettering system alert the Ram organization that the prospect is an outstanding player with problems or deficiencies. It will be the Head Coach, Presidents, VP/Player Personnel, and the College Scouting Director decision where, when, and if at all, the organization drafts this type of prospect. We would like to find Multi-dimensional players who can stay on the field all three downs. They will have more value than a role player, who will only be on the field part time. There is certainly a place for the role player, but he MUST be exceptional at what he does best, with the ability to help on Special Teams ASAP! We would like the prospects to meet the Height, Weight and Speed minimums for the position. If a prospect is at a lower level of competition, they must dominate their level. The following lettering system helps Personnel Executives and Scouts describe the prospect’s deficiencies or character issues, these are RED flags and sometimes MAJOR ALERTS for our Organization. These letters will appear in the system and print out on reports, but not shown with grades on prospect labels for the Draft Board. A Prospect with academic problems, no longer at the University, has transferred to another University, academic failure and no longer in school. B This player presently lacks the BULK for the position, but has the frame and growth potential to add weight in the very near future. With time and weight room development, this player will reach the minimum weight for his position. C This player has some very serious CHARACTER issues that the Organization should be aware of. It may involve drugs, steroids, alcohol, criminal, temperament and/or disposition, uncoachable, low motor. This type of prospect warrants further investigation into his problems. D This prospect has no real weakness; however, he is not ready to contribute at the NFL level of competition because he needs further development for any number of reasons, e.g. inexperience at the position, level of competition, poor or little coaching, the system and how he was used. Be careful when giving this letter to a prospect, it is not a catchall category to keep a player alive. F This prospect lacks the frame to ever add enough weight to bring him to the minimum weight necessary for the position. M His Mental capabilities in regard to football intelligence warrants further investigation. This player may have a learning disability that might not allow him to play football at the next level. A (10) or single digit Wonderlic test score is a major RED flag that there are some learning issues. O This prospect will grade high in competitiveness and production, but fall short in critical factors, particularly A/A. He is the great motor guy who plays with a lot of heart and fire in his belly while making a lot of plays against all levels of competition, in spite of his A/A shortcomings. He is an OVERACHEIVER and this is not a negative. There is a place in the NFL for a player like this that is smart, aware, great character, is tough both physically and mentally and productive, but just not a good athlete. P A PROJECTION to a position in the NFL that the prospect has never played in College is a huge decision. This is a true projection and the move to the new position is going to require refinement and time. For example Offensive linemen are not projections to another area of the offensive line; however, an undersized down rush end to linebacker is because you have not seen him play at that position. We should have no more than two/five (P) players each year. Grade the player at the position you see him at – don’t get into the projection business. T Prospects who are generally very Tight/Stiff. He has flexibility problems that affect his play. This player will always have a degree of difficulty in bending his knees, dropping his weight, changing direction, getting in/out of cuts. He is generally a straight-line player who may or may not possess initial quickness and borderline speed. A scout should not put a letter (T) on a player graded 6.0, if you do, be ready and able to defend your decision. U This prospect is an UNDERACHEIVER. He has high critical factor grades, but grades out very low in competitiveness. He has a low motor, lack of desire, poor work ethic, etc. He has all the measurables and A/A, but doesn’t play up to his ability. A possible coach-killer type of player so be very careful. W Weight issues throughout career; eating disorder, binge eating. Where weight will fluctuate 5-30 pounds during the season/off-season. X This prospect has missed a lot of time or is presently INJURED. He has had a list of medical problems in his history that warrant further investigation. Any situation which causes a prospect to take time off from practice, miss part or all of some games or not play as well in certain games, must get a (X). This would include orthopedic problems (chronic knees, arthritic spines, stingers, etc.) as well as such things as asthma, heat problems, and eye problems. Athletic Ability – Quickness, Agility, Hand and Eye coordination, Balance, Fluidity of movement, Flexibility and Change of Direction with overall body coordination. Strength Explosion – Not weight room strength but functional strength in upper and lower body. This is the player’s ability to overpower his opponent: breaking tackles, running over defenders, explode into defender, ability to stack and neutralize, leverage, and playing through blocks, explosion into tackle, out leaping opponents and use of hand explosion. Playing Speed – Pad speed during game competition. This does not always relate to a prospects timed speed, as some players run slower with their pads on, while others run faster than their timed speed, with their pads on. It relates directly to a player’s Start, Acceleration/Burst, and Change of Direction along with his stride and fluidity during game and practice situation. The Scout is responsible for a visual evaluation of estimated playing speed. Competitiveness/Production – A prospects toughness and intensity, both physically and mentally. A WIN at all cost clutch player, who wants to be the best, works at being the best and plays with confidence and aggressiveness. His competitiveness will tie in with his work ethic, both on and off the field and would go hand in hand with his Production. It is difficult for a prospect to be a good competitor unless he has Production, though there may be some exceptions to the rule; (playing out of position), hustle and second effort. Size – A prospect must meet the minimum requirements for his position. Obviously, the bigger a player is from the norm for that position, the more value he has and should be graded accordingly. Mental Qualities – Intelligence; ability to learn and retain football information; Wonderlic. Toughness – Mental and physical toughness. Passion for the Game – Must love the complete process of the game of football. Off season and end season training. Rehabbing all injuries to get back on the field as soon as possible. Football Instincts – Naturally instinctive player. As in other team sports like soccer and baseball, football requires players to play distinct positions. Players in each position have different responsibilities and line up in different areas of the field. Thus, knowing the name and role of each football position is critical to learning the game. If you’re a beginner, knowing the ins and outs of each football position can help you pick the one best suited for your skillset. For this article, we’ll cover the basic football positions on both offense and defense. Offensive football positions are all aimed at achieving one goal—advancing the ball down the field and scoring a touchdown. That sounds simple enough, but each position has different responsibilities, which the players must carry out for the offense to be successful. Here’s what a basic offensive set looks like. Now let’s break down each offensive football position. The quarterback is one of two players who touch the ball on every play (the other being the center.) To begin each play, the quarterback lines up behind the center and receives the ball when the center “snaps” it. How far the quarterback stands from the center depends on the formation. Once he receives the snap, the quarterback can either throw the ball or hand it off to another player (or run it himself). Playing quarterback requires a high level of intelligence. You need to be know what every offensive player does on every play and occasionally adjust the play based on what the defense is doing. Speed is not essential to success at the quarterback position, but it certainly doesn’t hurt. The typical quarterback is a tall, intelligent player with a good throwing arm and strong leadership qualities. The other running back, called the fullback, usually lines up directly in front of or directly next to the tailback (which also puts him in close proximity to the quarterback). His exact alignment depends on the formation. For example, in certain offenses the fullback lines up right behind the line of scrimmage, an alignment in which the fullback is commonly referred to as the “H-Backs.” The fullback is typically the player who lead-blocks for the tailback on running plays. They’re usually strong, stocky players who can move defensive players out of the way to give ballcarriers room to run. Occasionally, fullbacks receive a handoff and run the ball themselves. This usually occurs when only a small amount of yardage is needed. They also occasionally go out for for a pass. The typical fullback is a tough, powerful player with above average size and a knack for blocking. The center begins every offensive play by snapping the ball to the quarterback. Together with guards and tackles, the center is a part of the “offensive line.” After he snaps the ball, the center’s main job is to block defensive players. Exactly who and how he blocks depends on the opposing defensive alignment and the offensive play call. Centers are typically fairly tall, thick players with good levels of strength. They are usually one of the heavier players on the offense. A good center must have a high level of intelligence, since it’s his job to communicate the defensive alignment to the other offensive lineman and inform them of their assignments. The typical center is a big, intelligent player who is good at snapping the ball and highly skilled at blocking. A standard football offense has two tackles on the offensive line. One lines up to the left of the left guard (and is known as the “left tackle”), and the other lines up to the right of the right guard (and is known as the “right tackle”). Tackles are typically the largest players on the field. Their primary job is to block defensive players. They are usually a tad quicker and stronger than the other offensive linemen since they often have to block defensive players in space with little or no help. Like the center, tackles need to be intelligent so they can analyze what the defense is doing and make the proper adjustments.The typical tackle is a large player who is highly skilled at blocking. The tight end is essentially a combination of an offensive lineman and a wide receiver. He’s typically bigger and stronger than a wide receiver yet smaller and faster than an offensive lineman. While tight ends can line up virtually anywhere on the field, they are most often aligned directly next to the left or right tackle. Although it’s common for one tight end to be on the field, it’s becoming increasingly popular to have two tight ends on the field at the same time. The typical tight end is a tall player who’s both a skilled pass-catcher and a serviceable blocker. Defensive football positions are all designed to achieve one goal—stop the offense from gaining yards and scoring. That sounds simple enough, but players at each position have different responsibilities they must carry out for the defense to be successful. Here’s what a basic defense looks like. Now let’s break down each defensive football position. Though the number of defensive tackles can change depending on the formation, most basic defenses have two defensive tackles on the field. Along with defensive ends, defensive tackles are part of a group of players known as the “defensive line.” Defensive tackles line up next to each other in the middle of the defense across from the offensive center and guards. Defensive tackles are typically very large players who can hold their ground even when being double-teamed by two offensive linemen. The main job of the defensive tackle is to prevent the offense from running the ball up the middle and to put pressure on the quarterback in passing situations. The typical defensive tackle is a fairly tall, heavy player with great strength who can hold his ground against offensive linemen. Though the number of defensive ends can change depending on the formation, most basic defenses have two defensive ends on the field. Their name likely derives from the fact that they “bookend” the defensive line. Their main job is to prevent the offense from running the ball to their side and to attempt to sack the quarterback on passing plays. Since their duties require them to cover more ground, defensive ends are typically lighter and faster than defensive tackles. The typical defensive end is a tall, strong player with the ability to hold his own against an offensive tackle and the speed and quickness to get to the quarterback or chase down a running back. The middle linebacker is often referred to as the “quarterback of the defense,” because he needs to know every defensive player’s assignment and occasionally make adjustments to the defense based on what the offense is doing. The middle linebacker is essentially a jack-of-all-trades—he must be able to stop the run and cover the pass effectively. The middle linebacker often finds himself in the middle of the action and usually leads the team in tackles. The typical middle linebacker is a strong, intelligent player who is a good tackler and can make plays both in space and in traffic. Most basic defenses have two outside linebackers on the field. Where they line up depends on the formation, but they’re usually about 3 to 5 yards behind the line of scrimmage and either just inside or just outside the defensive ends. Outside linebackers are usually a bit more athletic than middle linebackers, because they’re asked to blitz more and usually have tougher assignments in pass coverage. The typical outside linebacker is a long, strong athletic player who can make plays in space and is a solid tackler. The free safety typically lines up in the middle of the defensive backfield at least 10 yards away from the line of scrimmage. Often, he does not have a specific responsibility and is free to follow the ball as the play develops—hence the title of “free” safety. The free safety is expected to help the cornerbacks defend against passes, especially deep balls. If the offensive formation employs more than two receivers, a free safety may be asked to cover one of the extra receivers. The typical free safety is a small to average-sized player with good speed, range, anticipation and ball skills.